Why were we here instead of on the highway? 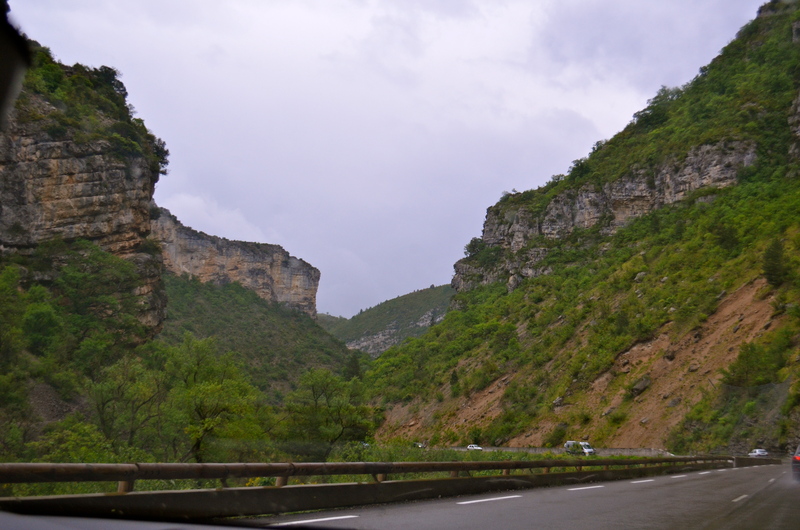 While heading north towards Geneva, we got off the road and got to see the beauty of the Vaucluse department in the Provence-Alpes-Côte d’Azur region of France. It’s a good thing it was so beautiful, because our 3-4 hour drive home ended up taking over 8. You can see why the Tour de France often rides through here. In fact, they’re headed through there this week. 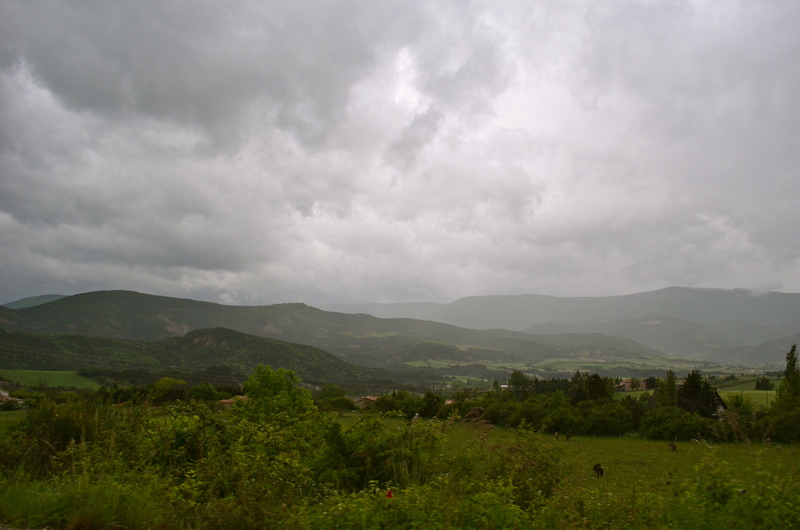 It’s near Gap and the infamous Mont Ventoux. The views of the dams and lakes, and mountain scenery are spectacular. At one time, Vaison-la-Romaine (which you might remember from the post about Provence’s Ironwork Bell Towers) was the capital for the Voconce people. 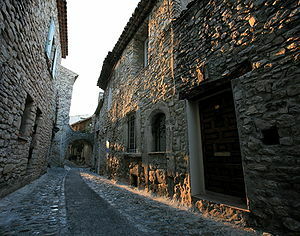 It is famous for its ancient Gallo-Roman ruins including a Roman bridge. The bridge is one of five remaining Roman bridges in Provence. It survived a German bomb during the World War II and the Ouvèze River’s devastating floods in 1992. 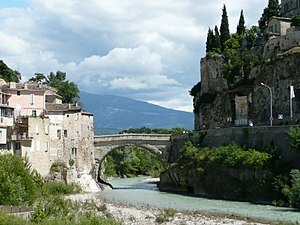 Vaison has two excavated Roman districts, and an Archaeological Museum. We weren’t the only ones who got off the highway and started taking side roads. 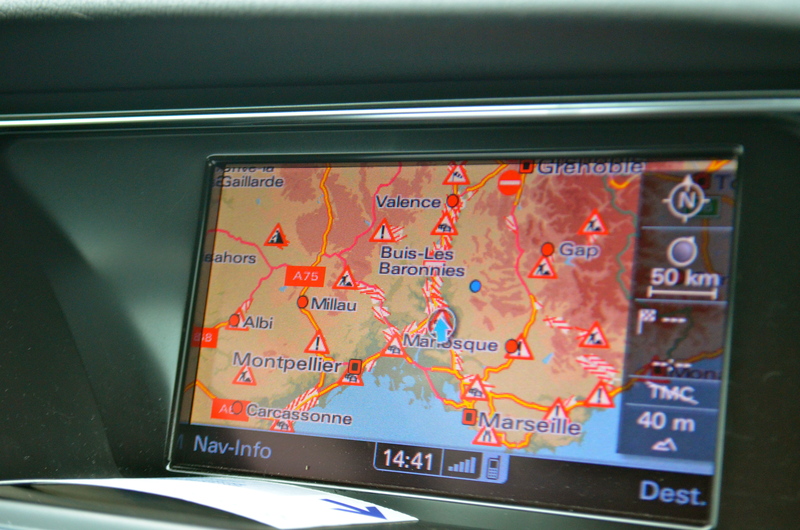 Since it was the edge of the alps, there weren’t many alternatives and the road was packed. Ironically, it was still less crowded and moved faster than in the south of France. We entertained ourselves by counting the number of people we saw pulled off on the side of the road answering the call of nature (over 10). 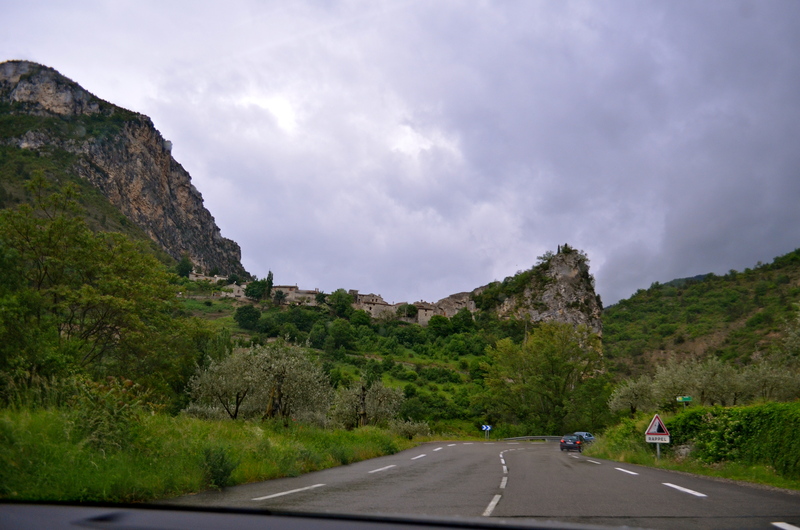 If you’re interested in a French vacation without the seemingly ever-present crowds, this is a part of France for you. If you’re a Tour de France fan, this is also a part of France for you. If you like simple bucolic beauty, it’s for you too. 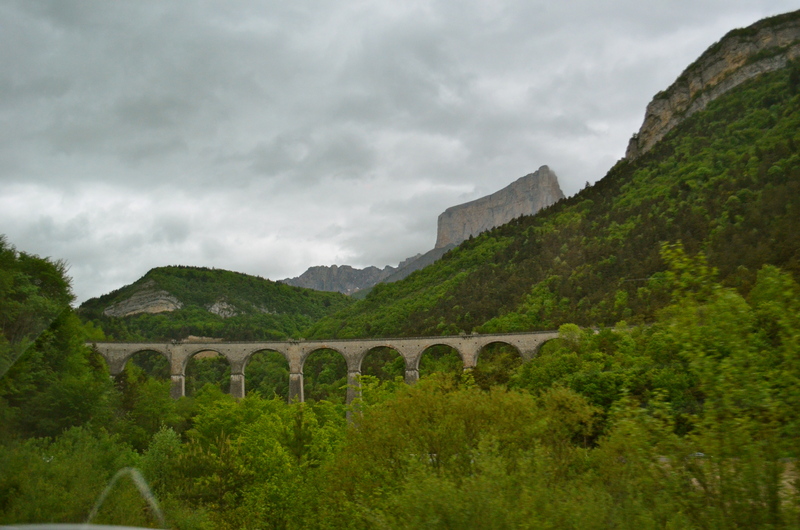 I think the photo below is a viaduct on the Grenoble train line (Chemin de Fer de La Mure/the Mure railway). 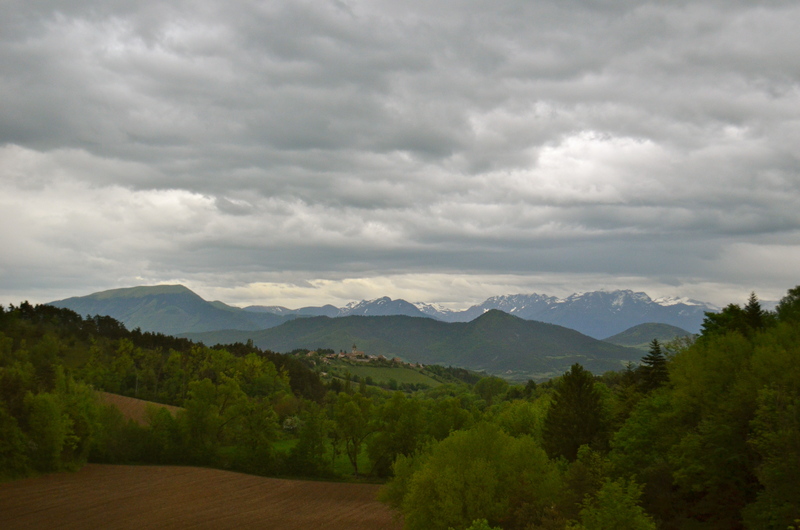 We saw it on the route from Orpierre (with its nice swimming hole in Les Gorges de la Méouge) to Grenoble. 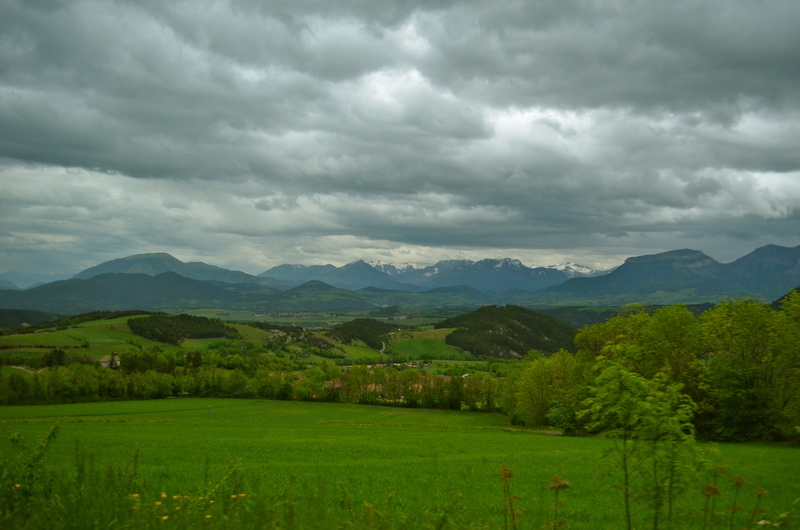 It can be reached easily by road from Grenoble, or by trains on the SNCF line towards Gap.